If we only consider "Uplink direction" and we assume that the UE is already attached to the network, then data is first received by PDCP (Packet data compression protocol) layer. This layer performs compression and ciphering / integrity if applicable. This layer will pass on the data to the next layer i.e. 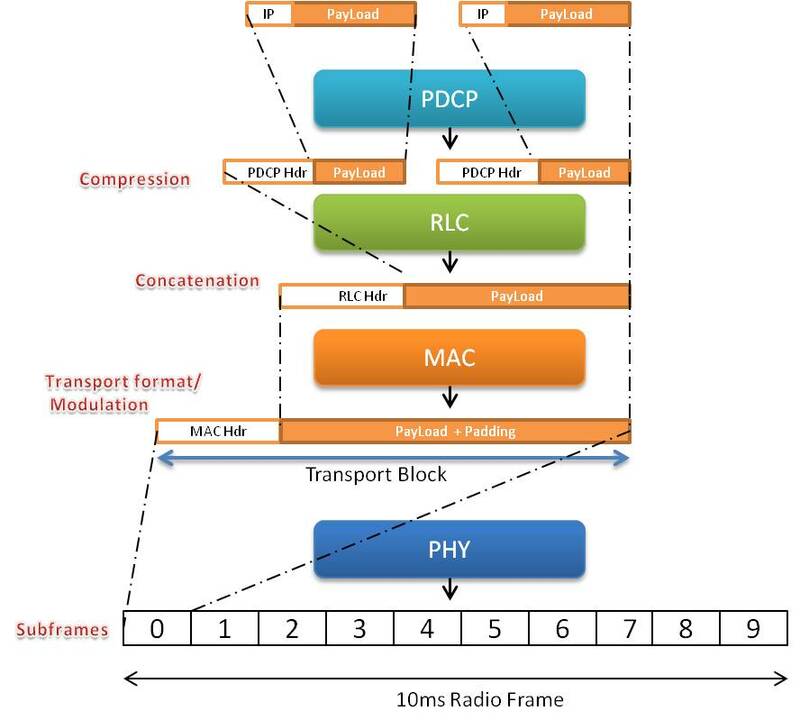 RLC Layer which will concatenate it to one RLC PDU. RLC layer will concatenate or segment the data coming from PDCP layer into correct block size and forward it to the MAC layer with its own header. Now MAC layer selects the modulation and coding scheme configures the physical layer. 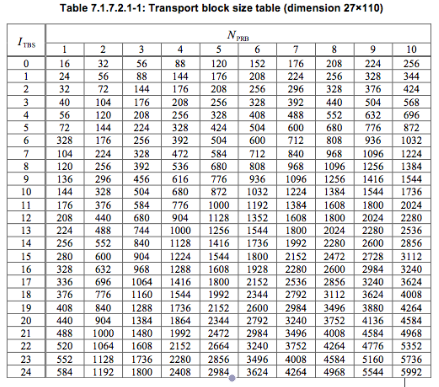 The data is now in the shape of transport block size and needed to be transmitted in 1ms subframe. Now how much bits are transferred in this 1ms transport block size? How is CRC bits caliculated to 24 bits in above example? please put some light on this as well. I don't get it. Seriously . I don't get it. Is the coding rate fixed ? I mean for different CFI and different transmission modes you get different number of REs per RB hence different coding rate. So the coding rate is not fixed. It mentions that the number of REs used for control channel is not fixed. While in some cases, the CFI = 1 makes the REs / PRB = 150/(84x2) = 0.8928 ... , so the assumption of 10% ratio reserving for control channels is approximately correct in most cases. Finally, the coding rate might not be fixed with this consideration. How does a packet travels between the internet gateway - PGW -... to the UE. Since all is managed by IP how does the headers change along the way. When a location update procedure is carried out, PDP-context is activated. The headers change all the way because the IP address of different entities at different layers is different. 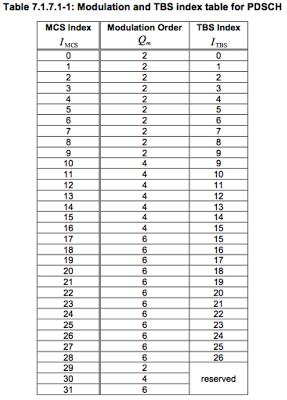 Thus, MME for example would have 2 unique IP address, one on layer 2 and one on layer 3, and each entity has its unique IP address. Can anyone explain why Itbs = 6 and Nrb = 1, the TB size is larger than the surrounding TB sizes including Nrb=2. This doesn't make any sense. It is also exactly the same size as Itbs=16. Could this be a typo? in the code rate calculation, you've mentioned number of ofdm symbols as 7. But one symbol is for DRS, so i think it should be 6 instead of seven. Because DRS cannot carry data..
how many OFDM symbols and Reference Signals per resource block are assumed in that process? in your example, the number of bits per transport block would it be: 2 (RB) x 12 (subcarriers) x 7 (assuming 7 ofdm symbols) x 2 (slots per subframe) x 6 (symbols/RE) = 2016 bits? How is this related to the number given in the table, 776 bits? thank you! You are not taking into account PDCCH symbles which could be at max 3 plus RS REs, if u deduct 3 symbols ( 2RB x 12 subcarrier x 11 symnols ( deducting 3 ) x 6 bits per symbol = 1584 including RS REs , with a relation 776 it gives roughly a code rate of 0.5. I am confused on how 6 bits per RE was derived. Bits per RE = 6 (Modulation order from table 7.1.7.1-1). How is it determined. The bits per Resource Element is 6, though Modulation Coding Scheme is not mentioned. Please clarify. Thank you. 1 RE carries one modulation symbol. 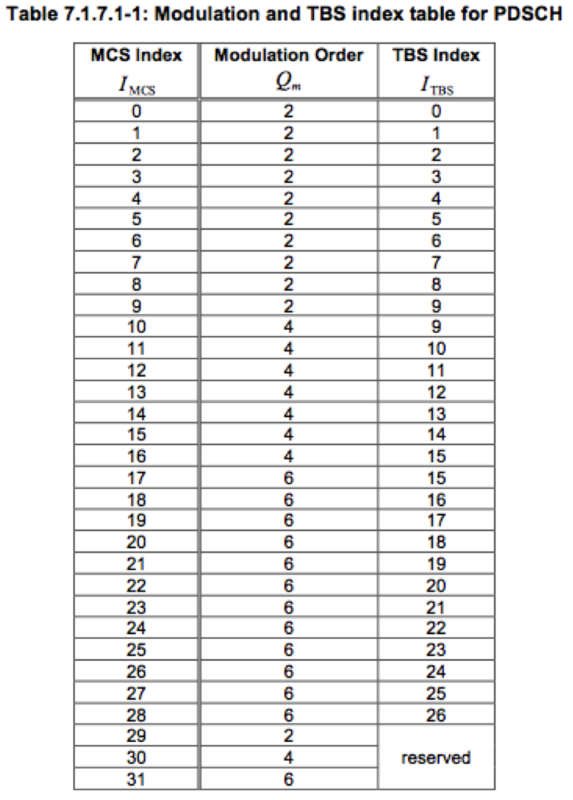 For the assumed MCS index of 20, table 7.1.7-1.1 tell the modulation order of 6 i.e. 64-QAM. Hence each RE carries 6 bits. It’s understandable that parents want to block sites that much, because quite often one can face dirty pics or unpleasant articles, take a look to find more facts about the app! Hi everybody, I would like to know what I have to do to account for the extended CP in the maximum throughput. If I take the equation for coding rate and assume 6 ofdm symbols (extended CP) I actually get a higher coding rate than using normal CP (normal CP = 0.75 and extended CP = 0.872), what seems wrong to me as it will increase the throughput. betting game that will come to you all. Money is not lost No need to travel to the provinces. Or at home to travel expenses. Smart cities are urban environments that leverage information technology-based solutions to maximize citizens' economic productivity and quality of life while minimizing resources consumption and environmental degradation. At this point, hopefully, the goal has been achieved of reaching a higher level of productivity than the level at which it started before the introduction of the new technology. The BlueTopaz Silver Earrings is a classical earrings with a touch of royalty. Your site is really helpful thanks for sharing info. Digital Platform For All Your Freight And Logistics Needs. great summary. I have a little wonder, how do you know the CRC = 24? is it fixed by protocol? Shifting or moving from one place to another is always a tiresome and problematic task. Often people become anxious while moving their home or office to somewhere else. If you are planning to move your home or office to a new destination then professional movers pune to bangalore companies can make your moving hassle-free and comfortable. Choosing a business Website Design Services can become a complicated job. The explanation for this can be that there are lots of businesses that offer you this style of services. The good news for those is there are several online ratings they can read through to find the most effective business that focuses on internet site design. We at Inventive Infosys are creating a Brand name and space online by helping bring other Business’s Ideas into Reality. We are here to cater to the needs of various sized Business Houses, helping them to establish their presence and Identity across the Global. We are here to help design, build and promote your website(s), software(s), Mobile applications, etc. Visit here Web design.